The Kellogg Community College softball team split a doubleheader at home Thursday with conference opponent Lake Michigan College at Bailey Park in Battle Creek. Below are results for the Bruins’ latest games. To sign up to receive KCC softball results by email, visit www.kellogg.edu/softball and fill out the “Get KCC Athletics Results by Email” form on the left side (desktop) or bottom (mobile) of the page. KCC fell 6-0 against LMC in the first game of an afternoon doubleheader Thursday. Sophomore infielder Tyler Snyder (Portage/Portage Central High School) led the Bruins on offense, hitting 1-2 from the plate; sophomore outfielder Jessica Roan (Battle Creek/Pennfield High School) hit 1-4. Head KCC Softball Coach Mike Miller said the Bruins missed a “golden opportunity” early in the game, loading the bases in the bottom of the first with no outs. 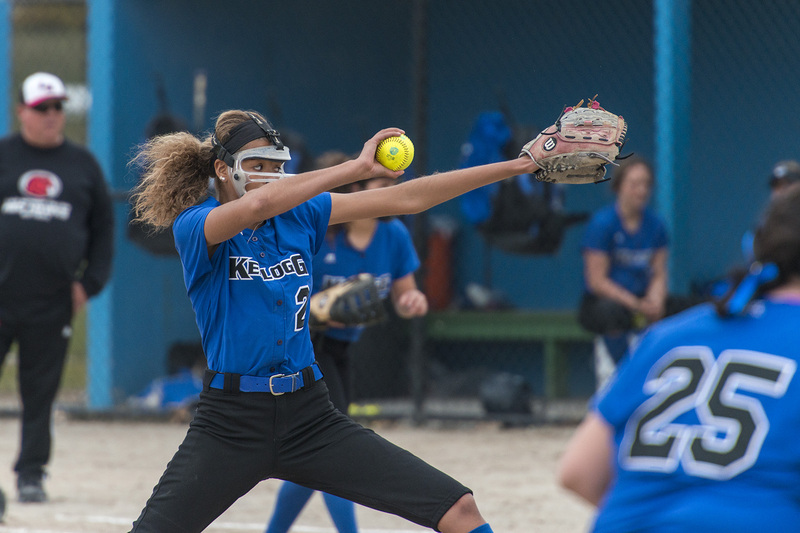 Miller said sophomore pitcher Alexa Stephenson (Battle Creek/Pennfield High School) turned in a solid effort on the mound, blanking the Red Hawks in five of seven innings pitched. LMC scored three runs in both the fourth and seventh. “She had command of her pitches and they dinged us twice for three runs in the fourth and seventh, but otherwise we played well,” Miller said. The Bruins were back in winning form for game two Thursday, besting LMC 3-0. Freshman infielder Katelyn Leckie (Parchment/Parchment High School) led from the plate, hitting 2-3, including an RBI. Renfroe hit 1-2 with two RBIs, while Roan hit 1-3, including a double. Coach Miller said KCC scored three runs in the third with two outs and held the Red Hawks in check to get the shutout victory. Sophomore pitcher Kylie Masko (Grand Haven/Grand Haven High School) pitched a no-hitter through four innings, striking out three and walking two. “Kylie had a good pace and the defense played solid behind her,” Miller said, adding that the Bruins rallied in the third inning. The latest results bring the Bruins’ overall record for the season so far to 3-13. The team plays next beginning at 3 p.m. today, Friday, April 13, against conference opponent Glen Oaks Community College at Bailey Park in Battle Creek, then plays conference rival Kalamazoo Valley Community College starting at 1 p.m. Saturday, April 14, in Kalamazoo. Head KCC Softball Coach Mike Miller can be reached at softballcoach@kellogg.edu.